Gold prices drifted near their lowest levels in a week Wednesday after being hit with their steepest retreat in more than a year a day earlier when the dollar strengthened. Financial markets are looking ahead to the afternoon release of Federal Reserve meeting minutes and another reading on the tone at the central bank as it looks to continue to tighten the interest-rate crank this year. Gold typically moves inversely to a firmer dollar and rising Treasury yields. Early Wednesday, April gold GCJ8, -0.02% slipped $1.10, or 0.1%, to $1,330.20 an ounce. The contract gave up 1.9% Tuesday, marking the sharpest drop for actively traded futures since Dec. 14, 2016, when gold sank by $33.90, or 2.9% according to FactSet data. But the metal remains relatively volatile. 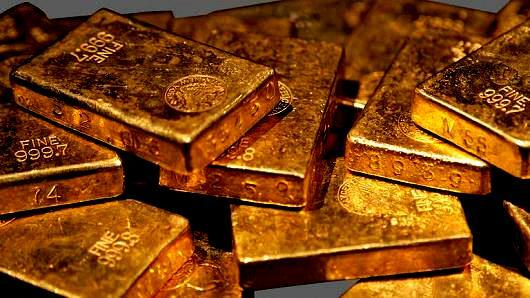 Last week saw gold register its sharpest weekly gain in more than a year, as it fed off the dollar’s slump. Meanwhile, March silver SIH8, +0.07% dropped 6 cents, or 0.4%, to $16.380 an ounce. The popular exchange-traded SPDR Gold Shares GLD, -1.34% fell 0.2%, meanwhile, and the silver-focused ETF, the iShares Silver Trust SLV, +0.19% also slipped. Precious metals lost ground as the dollar sprung higher following last week’s sharp decline, which has mostly extended a protracted downtrend for the commodity-pegged currency. The ICE Dollar Index DXY, +0.22% was up 0.3% to 89.97 Wednesday. A weaker dollar can boost commodities priced in dollars, because it makes them cheaper to buy for holders of other currencies. The Fed minutes are scheduled to get released at 2 p.m. Eastern. Ahead of that release, Markit is slated to deliver February readings on manufacturing and services at 9:45 a.m. Eastern, and a January figure for existing-home sales is due at 10 a.m. Eastern. Economists polled by MarketWatch expect 5.59 million homes were sold. Also on the Fed front, Philadelphia Fed President Patrick Harker is due to give a speech at Missouri’s Saint Louis University at 9 a.m. Eastern, addressing the economic outlook. In other metals trading, March copper HGH8, -0.39% lost 1 cent, or 0.5%, to $3.177 a pound. April platinum PLJ8, -0.28% shed $5.90, or 0.6%, to $998.10 an ounce. March palladium PAH8, -0.94% gave up $9.60, or 0.9%, to at $1,017.55 an ounce.